If you are looking for a pickup truck with an exterior that was specially designed, consider the GMC Canyon. You will feel proud driving about in this popular small pickup truck because it has a beautiful exterior. If you appreciate chrome accents, you will love the GMC Canyon and its exterior design. This truck features chrome mirror caps and chrome door handles. 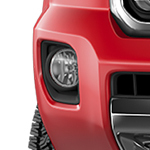 The GMC Canyon is finished with LED lights at the front of the vehicle. These lights help to keep the road before you illuminated and they also help your truck to have an appearance that is perfect. Finding a good truck is important, and you need to find one that you will love. Tom Ahl Family of Dealerships can show you just why you will love the GMC Canyon. Our team here in Lima can explain the features of this truck and the reasons that you will enjoy owning it. Stop by today for a test drive opportunity!